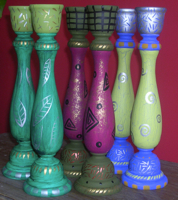 Consider candlesticks for all occasions—holidays, house-warmings, weddings, showers, bridesmaids, birthdays, Mother's Day, and teacher gifts. They make extra-special hostess gifts too. Pair them with a set of matching candles and you've got a perfect gift combo! Consider a lazy susan for the recipient who has it all! Lazy susans make a dramatic centerpiece on a diningroom table. To jazz it up even more, add some matching or complementary candlesticks, a candlescape, potted plant, or a bowl of some dried flowers or pot pourri. Your gift will leave their head, well, spinning! Consider a pair of beautiful earrings already hanging on an earring screen when you give this gift to someone special. Or give two gifts—boxed up jewelry and a storage solution too: a jewelry screen! 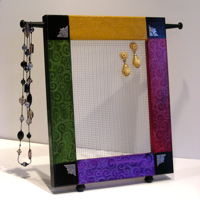 Consider a jewelry screen a special gift for a birthday, bridesmaid, holiday, teacher, or graduation. Consider not only dad on Father's Day, the coach at the end of the season, or the teacher who's a sports nut, but also moms, sisters, and daughters who play or enjoy hockey. This is the perfect paperweight for every sports enthusiast! 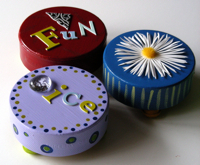 And, honestly, have you seen a lot of painted pucks lately? !